Doctors could never do their job without understanding the body. How can learners do their job without understanding the brain? Here’s the ideal resource to introduce your learners to brain basics. Through hands-on, inquiry based learning opportunities, learners will develop their understanding of the brain and its relationship to learning. Stress and its impact on learning will be explored, along with focus centres on brain waves and learning, music and learning, brain food and water, switch ons and switch offs, memory and learning, and brain gym® and learning. The brain basics package has been created through an inquiry approach known as the petite!nQ™ inquiry framework; a framework that identifies the stages of the natural learning process through an annotated pictorial model. Use of this framework, empowers students to learn independently through a process that mirrors real life thinking and learning. Learning styles, multiple intelligence theory, information/ communication technologies, student self assessment and evaluation, are seamlessly infused into the petite!nQuiry™ framework and thus into the design of the brain basics resource package. 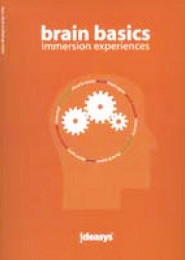 The Brain Basics Manual provides a ‘step by step’ guide to implementing the Brain Basics Inquiry. Information about the structure of the brain; the brain, stress and learning; music and learning; food, water and learning’; brain gym and learning; switch ons and switch offs and learning; memory and learning; and brain waves and learning, have been provided for use during the investigation phase of the learning process. Learners will use these information pages while engaged in the ‘jigsaw’ cooperative learning strategy. One Mind Map® has been created for each information area. Mind Maps® have been included in an effort to safeguard against disadvantaging learners who may struggle with linguistic resources. Learners who prefer visual or mathematical approaches to data collection are catered for and all learners are ‘immersed’ in the Mind Map® as an organisational tool. Task cards have been provided to guide learners in the immersion phase of the learning process. All tasks offer a ‘hands on’, multi-sensory opportunity to interact with data prior to approaching it more strategically during the ‘Brain Basics’ jigsaw activity. Each task card has been simply written and graphics have been included for visual support. Extensions have been offered in the form of ‘Challenges’ on many of the task cards. Most tasks have been designed in conjunction with an ‘organizer’. Organisers guide learners in their discoveries and direct them explicitly in the processing of new information. These organisers may be photocopied as required for student use. Additional organisers have been included to provide ‘extensions’ to the ‘Brain Basics’ immersion and jigsaw activities. Should greater rigor be required; or should learners wish to discover more information in the areas of body systems, teeth, nutrition or fitness, ‘detours’ can be taken using the ‘petite!nQuiry’ approach.